Hi friends! Today I’m sharing our top homeschool curriculum picks for History! 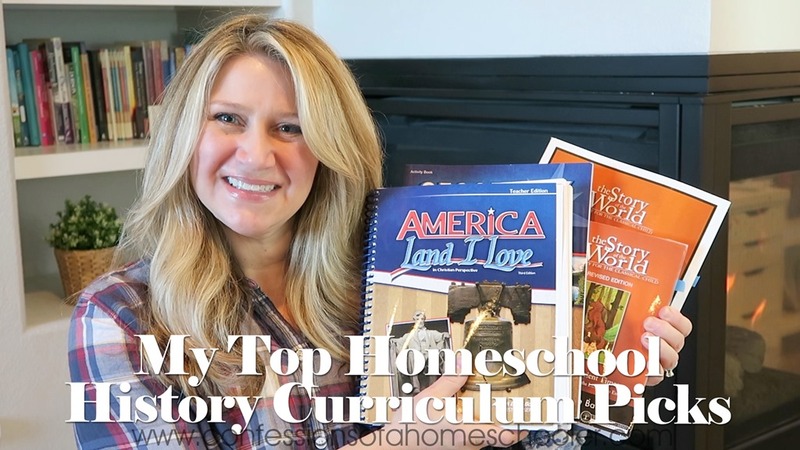 Watch my Top Homeschool History Curriculum Picks video here! Want more info? Stop by my History Curriculum Forum where I shared some of my favorite resources and my community piped in with their favorites too! Thank you for this video. I’m trying to decide on my curriculum for next and these videos are a great help. For you elementary kids did you use the Teacher Edition to teach the lessons for Abeka? I did use the TM because we had it, but if you’re just doing Letters & Sounds and the Language workbooks, the instructions are on the top of each page, so you can kind of get away without the TM. This coming up school year is my first year homeschooling and I am so thankful I found your website! have already ordered a lot of your products! I am so excited about Road Trip USA. I know my son will love it. Your advice and videos are truly a blessing. I am feeling so much more comfortable with homeschooling because of Your website 😃. THANK YOU!! !